2014 rolls in as the triumphant Chariot. His shield bears the image of Janus who looks to the past as well as the future. Supported by an army of seen and unseen followers and advisors he rushes forward to meet challenges head on. His warrior spirit drives over, around, and through the many obstacles in his path. His romantic nature sings of battles past and hearts that were conquered. His goal is to succeed and the universe agrees. Luck and Challenge will ride at your side this year. Each will have his influence, as the proverbial angel on one should and the devil on your other. Now is the time to try on your new image. Decide how the world should see you and then present yourself. Market your fresh ideas and network in the community. Be the person you always believed yourself to be. The keys to success dangle from your reins. Before you lies a road fraught with boulders and pot holes. Your prize (career, love, health, freedom, etc.) await you at journeys end. Better check your maps for the easiest route. Watch the weather report for the best days. Consult an oracle for good omens. Better still; reevaluate what the benefits are and your personal motives. Is this quest worth it? Is it in everyone’s best interest or is it just your desire to win. Be careful what you pursue for you’re likely to obtain it. Gather your allies and buckle up. This won’t always be easy so screw up your courage and charge. Your dreams and visions will guide you along the way. For better or worse these are memories in the making. A journal or photos should mark each occasion along the way. Remember, even if you don’t reach the moon you may land among the stars. This is the year to make your move. Career-wise you could change jobs, accept a promotion, join a new department, or leave the company. Home-wise you could change residence, buy a house or downsize, relocate to a new state or country, or remodel for a new look and feel. Adventure-wise you could take that dream vacation, explore new places, hit the road and travel for travels sake, or try new experiences. Love-wise you could redefine your relationship, go after your soul mate, rekindle an old spark with your romantic actions, or leave it all behind. There are no promises of ease, quite the contrary; this is a year of tests. But the universal promise is to gain at least partial success as long you make an effort. What would Ben-Hur do? Since the Chariot will influence us all this year, we must all participate in a call to arms. Turn up your truth detection and pay attention. This is a year to deal with aggression, lies, and substance abuse. War or peace may be determined by whether we pick up a sword or a pen. Too many charismatic leaders may be seeking victory. Businesses will step up their marketing. Our challenge will be to determine if the face they show is true. Have they really established fair trade and compensation or are they telling us what we want to hear? From a global perspective, new world leaders may step forward. Pray they side with peaceful negotiations, not war. Universally, the collective conscience is preparing for a shift. Many Prophets, Astrologers, Psychics and Seers are in agreement that this year will bring about challenge. Humanity is compelled to redefine its ego-mask. 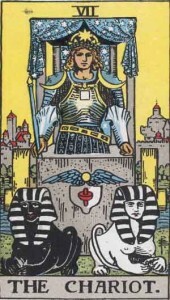 We have established some new rules and relationships in the Years of the Hierophant and the Lovers. Now is the age to do battle for our souls’ sake, might for right, and altruistic negotiations. This may be the year that defines what it means to be human in a new world order. *Akasha is a Sanskrit word meaning sky, space or aether. The Akashic Records are said to be a collection of wisdom that is stored in the aether. They are the astral record of everything that has ever been done. They contain the knowledge of all that is, was, and will be. One Response to "2014 Year of the Chariot"